This colorful painted tin heart with crown and ribbons wall decor combines the artistic soul and spiritual heritage of Mexico's people. 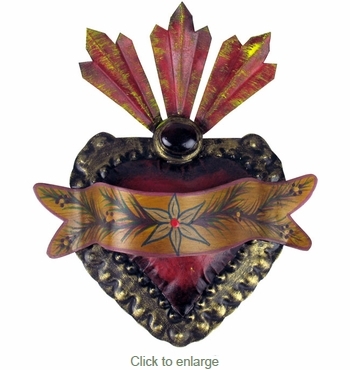 This beautiful hand painted heart on embossed tin can be displayed in a traditional home altar, or given as a special gift. ASSORTED DESIGNS NOTE: Our painted tin folk art items are handcrafted and handpainted. Expect some variations in size, color and design elements on these items. The item you receive may not match the image shown.